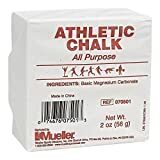 Solid form of magnesium carbonate (chalk). Available as a single 2oz block as well as a case of eight (price reduction for a case of 8). Used on the hands of gymnasts weightlifters and climbers to reduce the friction and to keep hands free from moisture. This entry was posted in Fitness Products and tagged Block, Chalk, Lifting, Mueller, Single, Weight by Summer 365. Bookmark the permalink.